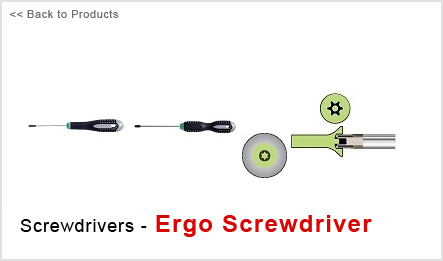 Screwdriver for Torx head screws with a hole in the end of the tip which fits over a peg in the centre of the Torx tamper resistant fastener. Ergonomically developed 3-component handle of polypropylene and thermoplastic elastomere. Permanent colour codes at both ends of the handle as a timesaving aid for application identification. Finish: blade matt chrome plated, entirely hardened, tip black oxidized.Material: blade of VANADIUM-EXTRA.BE-7940 with double handle.